The features that make a house beautiful and relaxing don’t have to be on the inside only. With the help of efficient, sustainable propane, homeowners are transforming their patios into fully furnished rooms - kitchens, dining areas, and open-air home theaters. Propane has an impressive variety of uses for outdoor living, including propane patio heaters; pool and spa heaters; landscaping features such as fire pits, lighting, and outdoor fireplaces; and outdoor kitchens. 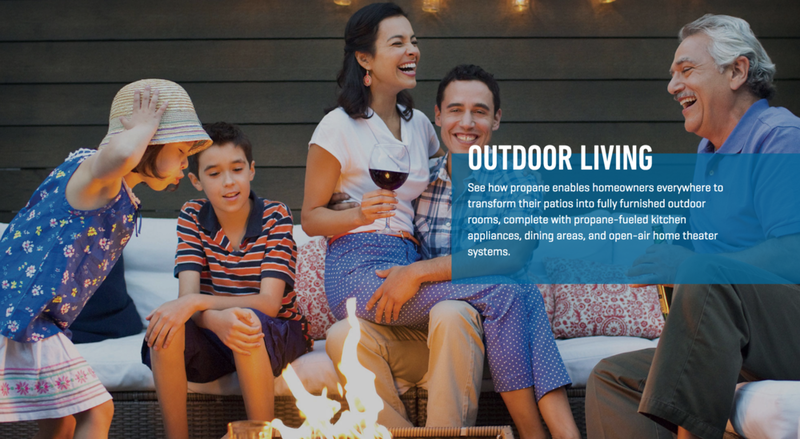 With propane, you can transform your backyard into the best room in the house. Just like an indoor gas range, propane grills give you instant on-off convenience and precision temperature control for a perfectly done meal, every time. With no coals, soot, or ash, clean up is a breeze, too. Real flame lighting creates an unforgettable look for your yard, and can be used for walkways, general lighting, and more. Powered by portable tanks or your home's main supply, they add beauty and value to any home, are totally odorless, and will function even during a power outage for added home security and safety. True foodies will love this ultimate outdoor cooking and entertaining experience. Powered by your home's propane supply, a full outdoor kitchen gives you all the benefits of your indoor propane appliances. With propane, chef-quality cooking isn’t limited to the indoors. From grills to cooktops (not to mention outdoor lighting and heaters), propane fuels great outdoor living. Real flame and real warmth at the flip of a switch. That's the advantage of an outdoor propane fire pit or fireplace. When you're done, you can shut it off instantly, too. No water necessary, and no messy soot or ash to clean up. A chill in the air shouldn't stop you from enjoying an evening outdoors. Patio heaters are available from tabletop size all the way up to standing models, and can safely raise the temperature up to 30 degrees Fahrenheit in a 20-foot radius. Heat your above- or in-ground pool or spa more effectively and more efficiently with a propane heater. They warm pools faster with lower energy costs compared with electric models. Search the latest cooking and grilling products below, or contact us today.